Here they are: more cherry blossoms! :) These are by 山口真 or やまぐち真 /YAMAGUCHI Makoto. Actually, this diagram is part of 3 type of modular/ unit flowers: a さくら /cherry blossom with 5 petals, a クレマチス /leather flower with 6 petals and a マーガレット /marguerite with 8 petals. I have only made the cherry blossom so that’s the only modular flower for now… The diagram for these flowers is on 折紙探偵団 MAGAZINE 通巻96号 /Origami Tanteidan Magazine number 96. An advice: small flowers need small and thin paper! For example the yellow cherry blossom (quite an odd colour for a cherry blossom, yes… :P) was made with 7×7 cm (2.8×2.8″) copy paper; the smaller ones were made with 5×5 cm (2×2″) in origami paper and with copy paper once more. As for me, the prettier flower is the one with the livelier pink (in origami paper). This entry was posted on 2007|07|01 at 11:24 and is filed under modular origami, origami. You can follow any responses to this entry through the RSS 2.0 feed. You can leave a response, or trackback from your own site. Where could I find the diagram to make this flower? Love yours flowers very much ! And yes, I use origami paper for some of my works but I mostly use coloured copy paper since it’s easier, and cheaper, to find. I am really impressed with these cherry blossoms (as I am with all your works). These are the best that I have seen in searching the web. I am in a big time crunch if I want to make these. I visited the site that you state we could get the magazine from but it shows it could take several weeks. Also, they do not sell issues seperately. Is there any way that this could be posted as part of your diagrams? This is the most gorgeous cherry blossom origami I have ever seen (and believe me, I have spent a lot of time looking for really great cherry blossom origami, with no luck!). But anyway, I adore your blog — it’s so inspiring. I actually had no idea that origami could get so complicated and mind-bogglingly complex until I stumbled across this place! i really like the modular cherry blossom that was featured in the tanteidan magazine number 96. could you possiibly make it available to for viewing online ? It would be nice. thanks! I love this cherry blossom. Can you please send me the diagram that was featured in the tanteidan magazine number 96? Wonderful! They look so simple and so beautiful. 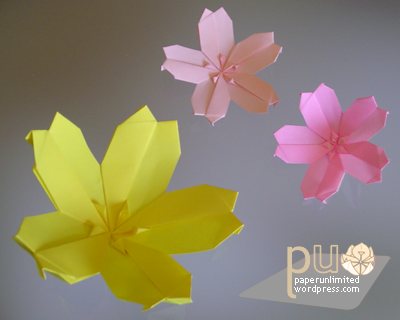 I had the idea of decorating my room with some branches with origami flowers on them, these would be very nice. Could you please send me the diagram from the Tanteidan Magazine? I’ve been looking for the WWW for my research on this topic. I’m so glad what you shared brings a new attribute to the data I’m compiling. I really appreciate the way which you look at this field, it provide me a unusual means of looking at it now. Thanks for the share. This is really beautiful. is it possible for you to send the diagram form tenteidan magazine to me? I have tried hard to find some pretty cherry blossoms and this is amazing! it’s really pretty, and i would like you learn how to make them, can you scan the magazine and send it to me as an attachment? if you do , you are very kind- and talented!! This is beautiful, I wish I could see the diagram for this. I have something similar.. I scanned it from a book. Thank you SO much April!!! for the love of all that is good in this world, please do a video tutorial of it over on your website. i’m a newbie :( and i can’t read japanese.